This newsletter includes articles about fotpin’s special activities at the Pinnacle this Autumn. This has been a pretty busy and rewarding Autumn for fotpins and all those who helped with the activities. Of course, the activities are in addition to the usual and regular weed control, bird counting, rabbit burrow mapping and other activities that continue through the seasons. Note for Internet Explorer users Prefer to print? John Brannan is a long-standing and active Friend of the Pinnacle. He is also a member of the Canberra Ornithologists' Group and undertakes regular bird surveys at the Pinnacle Nature Reserve. John leads regular bird walks at the Reserve, and happily shares his extensive knowledge of its birds with those on his walks, with his fotpin weeders and planters, and, indeed, anyone who asks a question. Elizabeth Smith is the fotpin Newsletter Editor and is particularly interested in native birds and plants..
About 16 people attended of whom some were fotpins; for a few this was their first visit to The Pinnacle; some were very experienced birdwatchers and some less so. It was an interesting and companionable group. (male and female), as well as a Yellow-faced Honeyeater. 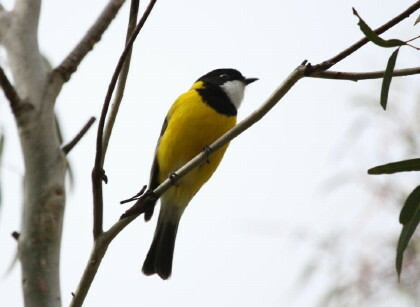 A special treat was the Golden Whistler which obliged by sitting in a tree long enough to be photographed, and thoroughly observed by even the most amateur bird-watcher. John Brannan is remarkably good at identifying birds by their calls. He heard a pair of White-throated Tree Creepers calling, and some of us were lucky enough to see them climbing agilely up a tree-trunk seeking food. Not far below the Pinnacle to the East, we saw a splendid example of a Noisy Friarbird’s Nest. 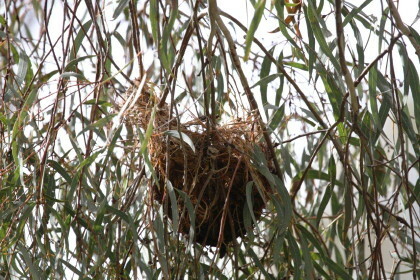 Typical of honeyeater’s nests it was hanging within a cluster of leafy branchlets. The upper corners suspending it are typical of the Noisy Friarbird. The nest looks a bit small for the size of the bird and in fact it is: the nesting bird pokes its head out one end and its tail out the other, looking a bit as if it is wearing a tea-cosy. 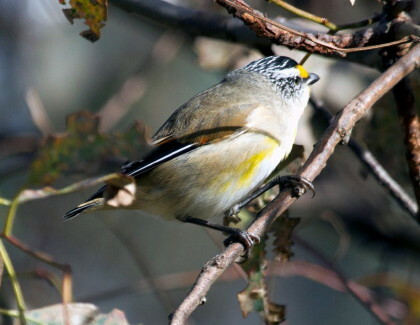 The Spotted and Striated Pardalotes are both often seen at the Pinnacle. We saw a couple of old Spotted Pardalote nest burrows, dug into banks. 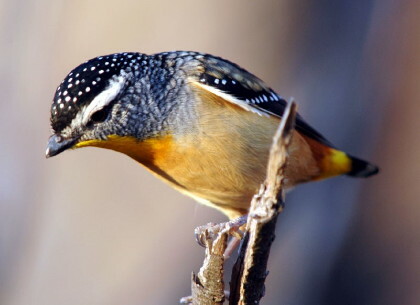 The Spotted Pardalote builds these and uses them once only. The Striated Pardalote may reuse their cousins’ nest burrows. About thirty bird species were seen, or identified by their call, during the walk, including some less common ones. Yellow-rumped — groundlayer, often seen feeding on the ground in parks, reserves, etc; likes to have shrubs/low trees handy to fly to for cover. Similarly, if you are having trouble distinguishing the Scarlet from the Flame Robin (especially if female) think about where they are. Scarlets are mostly woodland birds, while Flames are more open country birds, often seen on roadside fences near paddocks. Towards the end of the walk in the Forest Block we saw the classic LBBB (Little Brown Bush Bird) in a thicket of scrub. It was tentatively identified by a couple of observers as a White-browed Scrub Wren based on a brief glimpse and the habitat. Following the rains in early Autumn there was an interesting range of funghi to be found on our walk, ranging from delicate, lacy caps, the size of a 5 cent piece to white-gilled funghi the size of a small saucer. As usual this was a very rewarding and enjoyable walk. Keep an eye out for the timing of fotpin’s Spring Bird Walk, to see a range of different birds during the breeding season. John Brannan is currently the fotpin Coordinator, and has organised and led fotpin's revegetation activities since they began in 2011. Alison Milton is a Friend of the Pinnacle with a keen interest in birds, plants and photography. Elizabeth Smith has a keen interest in revegetation and monitoring biodiversity and was active in the Thursday Weeding Group until her back stopped her from hoeing..
As part of its program of autumn activities, fotpin undertook some plantings on either side of the Valley Track on Sunday 26 April. The aim of the planting was to add to previous plantings and, in particular, to provide additional understory and groundcover species. The weather was very kind to us, a bit surprisingly, given how unpredictable it has had been for the previous few weeks, and fortunately the rain stayed away on Sunday morning during the planting, though it was a bit misty early on. One early arrival had time to check out the local birdlife, spotting a White-eared Honeyeater, White-throated Treecreeper, Scarlet Robins, Grey Fantails, Grey Shrike-thrushes, numerous Thornbills, a pair of Striated Pardalotes, one of which she photographed (below), along with the more commonly seen Magpies and Rosellas. The plants we used included shrubs, flowering herbaceous plants, grasses and some small trees (acacia). 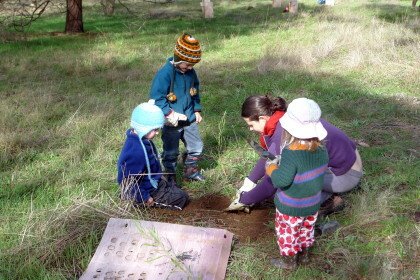 They were generously provided by Greening Australia with funding from the ACT Government's Woodland Restoration Project. They are all endemic to the Pinnacle Nature Reserve and were locally sourced. 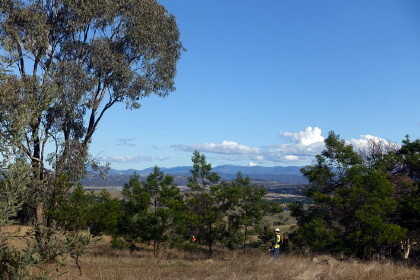 The photo to the right, taken along the Valley Track at the Pinnacle after the planting day, shows the plant guards and stakes (protecting the new plants) and in the distance the water tank. All of these need to be organised before the planting day for the longer term success of the plants. Augering the holes for plants was done beforehand by contractors provided by the ACT Parks & Conservation Service, who also kindly refilled the water tank so we'd have water for the planting. Many thanks to PCS for their help in making this possible. Thanks are also due to the fotpins who helped with the preparations for the planting by collecting the tree guards and stakes from a previous planting so we could re-use them, and those who helped with emptying and relocating the water tank from the previous planting site. Keep an eye out for notices and for information on fotpin’s website about future planting days, usually in Autumn or Spring. 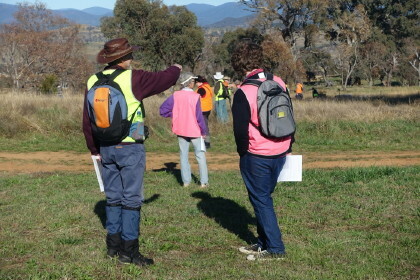 It’s a lot of fun, you get to meet like-minded people and you help to maintain and regenerate an important part of Canberra’s natural environment. Warren has been a member of the fotpin Coordinating Committee since its inception and has had two stints as Treasurer; he is a stalwart of the spraying team and, along with many others, has participated in all five of fotpin's kangaroo counts. Elizabeth has been a member of the fotpin Coordinating Committee for several years and served as Secretary for two years.. 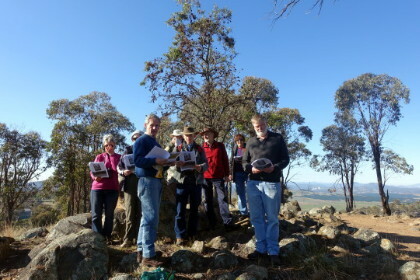 This autumn’s kangaroo counts took place on a beautifully sunny day at the Pinnacle, once again under the guidance of Don Fletcher from the ACT Conservation, Planning and Research Unit. More than 40 people took part over the day (half for the morning count and half in the afternoon), a mixture of fotpin stalwarts, other folk who often join us for the count and some new faces. The results of the two counts were not quite as consistent as in previous years, but still within the accuracy required. The average of the two counts (613) showed a slight decline in numbers compared with previous years, presumably attributable to the cull carried out after the count in 2014. Both the morning and afternoon counts ended with light refreshments (thanks to the Cox family) and they were greatly appreciated by everyone after walk across the often-difficult terrain. For more information (and photos) of the count, see the 2015 count webpage. You also might be interested in the kangaroo count photo gallery, a selection of photos from our 5 years of counting, the detailed count results, or the overview of fotpin’s involvement in kangaroo management. Warren has been the fotpin webmaster since its inception and looks after our burgeoning data collection and digital records. He is a stalwart of the spraying team, specialising in Briars and other woody weeds (including Blackberries) and Verbascum. ). The walk was built around the opportunity to visit locations where we had photographs taken some years ago and compare them with current views. Other stops were included along the way where we could view and/or discuss progress with weed control, revegetation and remaining conservation challenges on the Reserve. We are fortunate to have a collection of photos taken on the Reserve by Mark Hallam in 1991. Mark, a member of fotpin, was also a member of the Pinnacle Environment Group (PEG) that was active in ParkCare in the 1990s. Mark has taken the time to digitally scan, and make available to fotpin, his collection which documents various PEG activities, primarily tree planting, but also walks, track building and other events. The walk visited a small subset of locations where those photos were taken to demonstrate the enormous changes that have taken place since PEG’s efforts in the early 1990s. Our first photo comparison opportunity was at the cavaletti near the noticeboard, just up from the De Salis St. entrance to the Reserve. 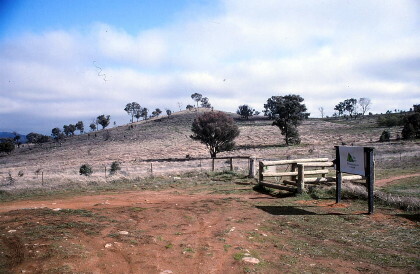 Mark’s 1991 photo (opposite) shows a near-barren Pinnacle; the slopes are clearly visible, as are the tree guards dotting them and hinting at what the view would become today. The trees planted in the foreground now completely obscure The Pinnacle’s slopes, but the tree at the top, one of the few in the 1991 photo, is clearly identifiable and allows the observer to orient themselves and marvel at the change. You can see the comparison between the above photo and the present day view at the Pinnacle Changes webpage, where you can also see the next three comparisons. Walking on, up the path to the summit of The Pinnacle, we were able to compare present day views with two images from 1991: one looking roughly south and the other looking northwest. Again there are sufficient features for orientation, and again we were fascinated by the changes brought about by PEG’s efforts. Users of the Reserve today owe a great debt to the foresight and hard work of the PEG group, without whose efforts the Reserve would be a much less pleasant environment for a recreational stroll. Our final comparison of current day vegetation with that from 1991 was about half way down the Macrorhyncha Track. It would seem from the 1991 photo that the forest had been relatively recently burnt and the comparison with today’s view, with considerable understory vegetation and litter, was stark. Click here to see all comparisons between 1991 and present views described above. ). 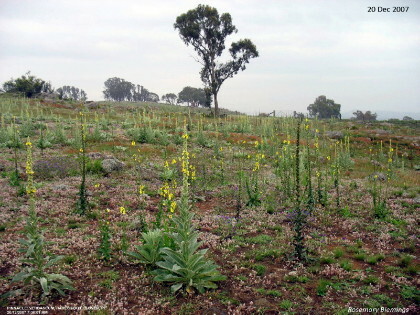 Between the boundary track and the fence was once visibly heavily infested with Verbascum, as the accompanying photo from 2007 shows. The view that greeted our walkers was very different; no Verbascum stalks and a good cover of grass (albeit mostly oat grass). This is the result of several years of attention to Verbascum removal. The Verbascum has not been removed completely and there are still many rosettes to be found amongst the grass each year, but fotpin efforts have ensured that walkers are no longer greeted by a forest of Verbascum stalks, not only at this location but right across the Reserve. Complete removal of many weeds is difficult and control of Verbascum, with a seed longevity in the soil reported to be decades, is definitely a long-term project. Fotpin’s key aim is to prevent weeds such as Verbascum setting seed, thereby minimising the seedbank for the future. At the same time, by preventing and removing seed stalks, we improve the views that walkers encounter and the amenity value of the Reserve. The area around where the photos were taken is now used as a test area, where the amount of effort and the amount of chemical needed to control Verbascum each year is carefully monitored (see the five-ways Verbascum page). It has produced some interesting results including that the amount of Verbascum present varies considerably from year to year. In 2015 we were able to establish a good correlation between the amount of Verbascum and the amount of rain in early summer (November through to January). Being able to predict the severity of infestations by particular weeds each season enables more efficient deployment of our scarce resources. As with the control of Verbascum, controlling Saffron thistles is ongoing but achievements to date represent an improvement in the amenity value of the Reserve. In 2010/11 many areas of the Reserve, including many of the tracks, became impassable as a result of the vigorous growth of Saffron thistles in response to the breaking of the drought. Fortunately we have not seen growth like than since, but control of Saffron thistles remains a high priority for fotpin. We included in our walk a visit to two areas in the Kama paddock where Saffron thistles were particularly rampant in 2010-11. Photos taken at one of those areas are shown here. While the views are not identical, they are indicative of the prevalence of Saffron thistles at the two different times. Although the prevalence of Saffron thistles is nothing like it was in 2010-11, they are still one of the weeds that we have most difficulty preventing from seeding across the Reserve. Along our walk we passed several locations that have had among the highest briar densities on the Reserve during the four years when their numbers have been recorded. These included two locations under specific trees and one open area. These provide examples of dense areas resulting from two different suspected sources of briar infestation, namely importation by birds and spread of seeds from previous infestations. 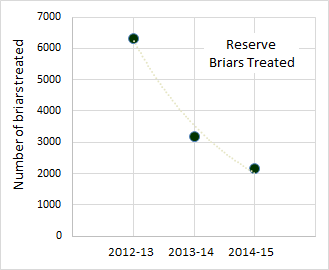 With the exception of one of the tree locations, there is a definite decline in briar numbers, indicative of the decline over the whole Reserve; the number of briars on the Reserve has decreased by one third each year for the past two years. While there has also been a decline in numbers at the "exception" tree, it has been much smaller suggesting that the birds’ source of briar hips has yet to be eradicated. Details of these sites may be found on the briar control indicators page, where a more detailed discussion of briar control can also be found. Those of us who get off the beaten tracks in the Reserve can’t help but noticing the many, large, bare areas where kangaroos camp. These are something fotpin has been keeping an eye on for some time. Although they are not an impact of kangaroos on conservation areas that is often considered, they result in loosening of the soil, removal of vegetation and also exposure of the soil to erosion, which has been quite considerable in some places. Our walk took us past some of these camps on the southwest facing slope of Kama paddock, including where the photos in the link above were taken. More information about the impact of these can be found on our kangaroo camp webpage, where it can be seen that they are widespread across the Reserve. Dealing with these requires not only reducing kangaroo density on the Reserve (currently twice the “conservation density” proposed by the ACT Government) but also considering rehabilitation of the degraded areas that the kangaroos no longer use. As we traversed the Reserve, we passed through three of the areas where fotpin has carried out revegetation activities in the last four years, from the oldest (October 2011, straddling the boundary between the Forest and Kama paddocks south of the intersection of the Macrorhyncha and Dowling Tracks), to the newest (April this year, either side of the Valley Track, described in the article earlier in this newsletter), as well as the October 2013 planting (just south of the Forest in the centre of the Kama paddock). All three plantings were aimed at improving the density and quality of the shrub- and ground-layers, and improving bird habitat. While little had changed in the most recent planting, we admired the generally high survival rate and growth of plants in the earlier two; with tree guards removed, it was sometimes hard to believe that some of the shrubs were so recently planted. Along the way we also took time to stop and view where the Reserve’s largest blackberry patch had been a few short years ago in 2010 and where there is now barely a trace of it apart from some dead canes yet to decay. Throughout the Reserve we commented on the reduced number of rabbits thanks to the persistence of the PCS fumigation program over the last few years, aided by the location and reporting of burrows by fotpin. As an illustration of that persistence and the need for it, we passed a rabbit warren that finally, after three years of cycles of fumigation and reopening, no longer shows signs of occupation. Overall the walk gave the participants a good opportunity to ponder the “State of the Pinnacle”. 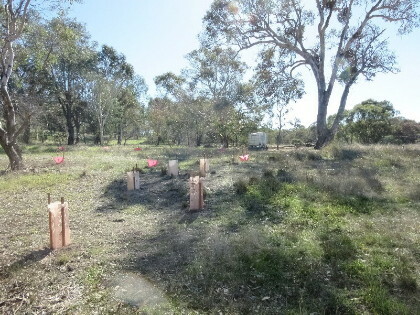 Seeing the effect of the revegetation carried out in the 1990s allowed us to imagine the improvements that will flow from the more recent plantings carried out by fotpin. We also saw that, while we still have many weed challenges before us, progress is occurring on some fronts and that persistence and thorough targeting of weeds does pay off. The Verbascum example also showed that by carefully monitoring what we do we can improve our efficiency in future years by being better able to predict the severity of weed infestations. Finally the close examination of kangaroo camps was an eye-opener for some and increased our determination to assist PCS to bring the kangaroo density on the Reserve down to the “conservation density”, hopefully restricting the overall impact of the kangaroos to a level that can be absorbed by the ecosystem. We hope you can join us when this walk is repeated in Spring. Could you contribute to future newsletters, which your editor hopes to publish quarterly? Later issues of the newsletter will include more information about the background work that fotpin does that you might not see. Keep an eye on the fotpin website for further activities such as plantings and walks around the Pinnacle, especially in Spring. If you take part in fotpin activities such as planting, weeding or walks, or if you wander/walk/jog/around the Pinnacle Nature Reserve, and have any comments, articles or photos you would like to contribute, please forward to the fotpin Newsletter Editor at newsletter@fotpin.org.au . Also if you have any suggestions about issues or topics you would like to know more about, relevant to the Pinnacle, let the editor know and we will see what we can do to find a response. Elizabeth, aka ‘The Newsletter Editor’. To view the pop-up windows you may be prompted with a message that says certain content has been blocked. You have fotpin's assurance that it is safe to click the "Allow Blocked Content" box for this page. If experiencing difficulties viewing the pop-ups, please contact the webmaster. While you can print the newsletter "as is" satisfactorily using your browser's "print" function, this the content of the pop-up windows containing extra photos and information will not included. Use the following link to open or download a pdf complete with pop-up content.